Yesterday marks ten months since I launched a page on Facebook entitled “Towards Greener Borders”, on 2nd May 2014. It is a platform with a purpose; an entity which currently exists merely on the internet but based in reality, run on an entirely voluntary basis and presently managed from a one acre organic property in the United Kingdom. Like so many others through the aeons, I find guidance, inspiration and parallels to human life by observing Nature. Since I was a young child growing up in South Africa, I have felt a deep affinity for the outdoors, for plants and wild animals, as well as native traditions and old ways of ensuring wellbeing. When I found myself living once again in the Borders (south of Edinburgh) a few years ago, I had great hopes of experiencing familiarity, peace and strengthening, healthful solitude in the British countryside here. We had returned to Britain after a long stint in Australia, before which I’d led a busy life in London and Edinburgh, after emigrating from South Africa to the UK (the birth country of my mother and grandparents) in the mid 1980s. Our family anticipated at long last being able to put down roots again, have freedom and enjoy life fully, benefitting from a well-earned and much-needed rest in the country, after a stressful few years including many home moves, as well as crossing continents and both hemispheres. Sadly, the opposite proved to be the reality, as ever more pressures mounted in the locality where we chose to buy our home in Britain, making the settling process exceedingly difficult. Having known for many years about the dangers of agricultural chemicals, and having learnt a lot in Australia about the use of these toxic methods in farming, and the residues they leave in food, water, air and soil, I had purposely searched for somewhere safe to live. It was difficult to find anywhere, near to my extended British family, that was not closely aligned with a ploughed and sprayed field, until we found our current home at short notice. Desperate to have somewhere of our own again, we had chosen to buy an old house on an acre in the hills, which we immediately assigned “An Organic Property”, despite it being set amongst farms. Unfortunately, the dream of peace and security turned into a nightmare and I soon found myself becoming increasingly tense living here, unable to relax in this (what was once a beautiful) country environment, in which we had eventually found our UK home. I discovered that I was more stressed and anxious in the British countryside than I had ever been, anywhere else, before – either in city or country. Although I had always loved the countryside (most especially in Africa) living here was like nothing I had ever experienced elsewhere. It was soon evident that we were sandwiched between several landowners, all working their land at the same time, ploughing, spraying and bombing down the road past our home, as if we did not exist. Life in the British countryside was proving to be anything but calm, anything but healthy, and anything but restorative. Then, when farming around us changed unexpectedly (from the peaceful grazing land that we had thought it to be), and we discovered that the house we had bought was to be chemically-farmed immediately beside (which had not been clear to us at the outset), and we were in the path of the prevailing winds carrying chemical drift from at least one other farm to the other side of us, my anxiety levels rose exponentially, but I did not know where to go to from here. We had already had several moves since bringing the family to Britain, and I had endured many personal moves prior to that. I was worn out with moving and readjusting… as well as not knowing a clear direction to take. So we remained where we had ‘landed’, and have been here for almost five years, which have been unbelievable, on many levels. As so often in the past, when faced with a challenge I have tried to use the challenge to advantage, not least to learn from it. Knowing that things were not as we had expected to find them here, nor seemed likely to change to suit our needs, the temptation to run away has been ever-present, and every time more and more chemicals are used around our home, I experience severe anxiety, coupled with a resulting shock response and debilitating fatigue. However, despite a desperate need to settle somewhere safe, we find ourselves unable to, and this has proven to be one of the few times in my life that I have found myself unable to walk away from something that was obviously not working for me. So, whilst the outside challenges have been immense, in the midst of the usual adjustments that one (and a family) has to make when moving to a ‘new’ country, and starting everything afresh, we have remained living where we are, in the best way we can, coping with all of life’s other challenges at the same time. Like so many others around the world now, I am acutely aware of the dangers, not only to the farmers themselves (and their families), but to everyone who is breathing the air that is being sprayed with toxins or covered with chemical fertilisers. Increasingly in the media, we are hearing about the deaths of native species, plants and animals, and the demise of vital pollinators … all being wiped out in the name of modern progress. I do not see this as progress; I see this type of land management and the chemical farming methods as dangerous, demonstrating limited thinking. We all hear about the evidence that this is the case, so simply shown by the severe decline of bees in the UK and Europe. I have said many times that “bees are the canaries in our coal mine” and I know that we do not need Science to prove that we are killing them. The picture is so simple and logical, that even a young child can understand it. I frequently quote Einstein, who said that we will have limited time left on earth, once the bees die. We are shooting ourselves in the foot by treating our earth with such disrespect and disdain. But, most poignant, is the fact that we are hurting one another by doing this to the earth, which is in all of our interests to cherish. I do not see the earth being cherished in these hills where we currently live, and I do not see it in many other areas of Britain either, and this worries me enormously. It is extremely short sighted of us to continue to do to our planet what has never been done before, and is already proving so futile, destructive and harmful … Man is hurting what he should be stewarding, and I see industrial-scale agricultural methods, on an island as small as Britain, being key to this alarming predicament. Instead of running away, I have decided to turn my attention to trying to help the situation, from my own limited circumstances, in the hope of inspiring others to change the status quo, to gather round the people who are doing just that, and to empower one another. I dream that it will be possible to transform this region into a positive, healthy and hopeful one, learning from the mistakes that have been made, and reassured by those around the world who have proven that it is possible to live well, making positive choices about food and farming methods, as well as in our own living and working environments. I know that it is profitable, viable, and sustainable to do so. While this is my personal story, providing background as to why I have created “Towards Greener Borders”, this page is intended to be a forum and a platform for all who feel similarly, and wish to find or share ways to effect positive environmental and lifestyle changes as well. I hope you will join us on this journey and help to spread a positive message of authentic, natural and organic sustainability. 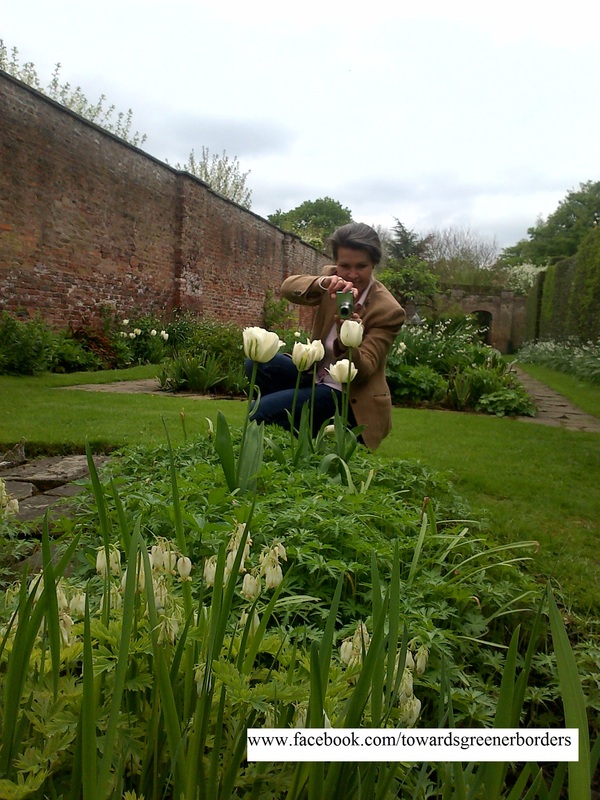 The Author, photographing Summer beauty whilst visiting an organically managed garden in England.